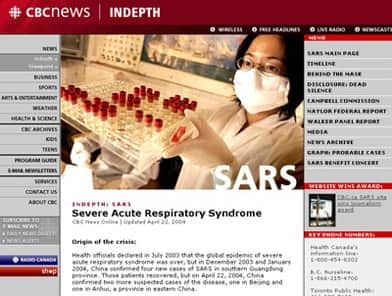 As soon as SARS was detected in Canada, News Online staff knew it was going to be big. It was the weekend of March 16, 2003. "Virulent pneumonia strain surfaces in Canada." Two people were dead and experts were at a loss to explain why. Immediately, staff began to cobble together an Indepth Section that would focus on basic health information — what the symptoms are, what to look for, what to do to protect yourself, and what scientists were saying. Since little was known about the disease at the time, we explained how scientists and medical researchers investigate new illnesses. We knew this would be the kind of information people would be looking for right away. We aimed to strike a tone that would not cause panic, but would provide people with the tools to inform themselves, even when very little was known. The challenge was to sort through hearsay and hysteria and get the facts. The main question for senior staff was how many people to dedicate to the story, given that the Iraq war was looming (and would begin in three days). Even with resources to hire additional staff, there was a shortage of experienced freelancers we could bring in who knew our system and wouldn't require lots of training time. In the newsroom, writers debated whether to report suspected as well as probable cases, what to call the disease ("sudden" versus "severe" acute respiratory illness. Scientists used both — We eventually went with severe) and how to deal with conflicting case numbers being reported by various official organizations. Our first site featured a large image of a health care worker, with a box listing SARS symptoms directly below it. We also supplied the numbers for Health Canada and included links to its site, the infection disease site in the U.S. and the WHO site. Our first FAQ answered questions such as what causes SARS, where did it originate, what are governments doing and how are patients being treated. We began a timeline to track developments. By March 17, there were 11 suspected cases in Canada. As we learned more, our coverage expanded greatly. We did backgrounders on subjects such as facemasks and hand washing, and what to do if you are quarantined. And we began to experience the impact of the story ourselves. Some found the experience scary. CBC staff went to hospitals where outbreaks had occurred, spoke to people who had been treating SARS-infected patients, and walked through Toronto's jittery Chinatown community. One of our staff described a trip to London in May. While at the BBC, she said, people were reluctant to shake her hands. Another CBC.ca employee travelled to Asia during the outbreak and recalled the screening procedures and new paperwork at several airports and border crossings in Toronto, Japan and China. She noted that because she came from Canada, she felt authorities were paying extra-close attention to her state of health. She was afraid to cough too much for fear of being quarantined. We worked with our health writer to explore the science in greater depth with backgrounders on the latest research and links to articles in medical journals. We began to tell the story in pictures through photo galleries. By March 19, the world death toll was 11 and Health Canada was advising people not to travel to parts of Asia. Soon we had so much content, we had to redesign the site. It ended up in the format it has now... http://www.cbc.ca/news/background/sars/ with dozens of backgrounders organized into sub-groups. By the end of the month the global death toll was 53 with 85 new cases worldwide. As tourism and international travel declined, we began to assess the economic impact. After Ontario declared a public health emergency and thousands of people were quarantined in their homes, we began to solicit and publish first-person columns from people who were affected in Canada and abroad. We published reports on subjects such as life in China and what it was like to visit quarantined hospitals. By mid-April we began to explore the public health issues and government response, which was criticized as being too slow. 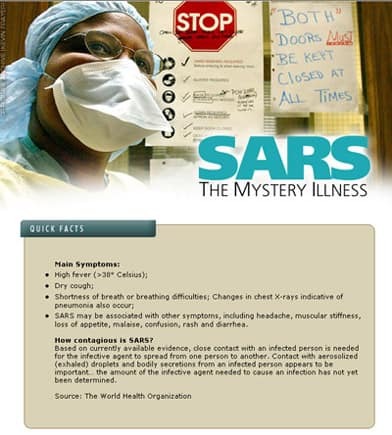 At that time, the federal government was trying to boost business by dispelling myths about SARS. We also published news stories about what tactics weren't working, such as airport temperature screening and reported on calls for increased public health funding in Ontario, along with the government's response. Meanwhile, the number of suspected and probable cases of SARS in Ontario rose by 11 to 206. The Canadian death toll by August has reached 43 people. We added a page with a bar graph which showed the number of cases peaking in Canada, dropping, then peaking for a second time. Throughout the crisis, we worked with our radio and television colleagues to post some of their best stories to our site. In one case we were able to post an item that television had no room for: a story about how a negative airflow pressure room in a hospital works to contain spread of the virus. On July 30, 2003 we capped our story with coverage of the major benefit concert which saw the Rolling Stones come to town. CBC.ca sent reporters and photographers to the packed event in Toronto. They did photoblogs and weblogs as the show progressed. Months after it was first detected, several scientific breakthroughs lead to more effective efforts to halt the spread of SARS. Travel restrictions, quarantines, the use of protective garb, all contributed to the slowing of the spread. A jittery public had made it through scare after scare — school shutdowns, old age homes, GO commuter trains — the tide eventually turned in Canada although the disease continued to claim lives in Asia. On Nov. 15, CBC News Online's SARS site won a prestigious online journalism award. The Online News Association gave the site top honours in the "service journalism" category. The judges said that this package "successfully walks a narrow line, reporting on a major crisis without being alarmist. It's an easy-to-understand presentation – a great one-stop source of information about a complex, and frightening, topic." The events that gripped us weren’t without moments of irony as well. One of our staff noted in his blog that CNN, NBC, CBS, BBC and ITN all sent reporters to CBC's Broadcasting Centre in Toronto to report on the World Health Organization travel advisory - not to come to Toronto. Lisa Khoo is Senior Producer for CBC.ca. She joined in 2000 after three years in the U.K, where she was produced news and current affairs for CBC-TV, reported for several magazines and wrote a book on the internet. Before that she was as a producer for CBC-TV National News for a decade in Washington, London and Toronto, including five years as part of television's Live Specials unit. Lisa has a bachelor of arts from the University of Toronto and a master's in journalism from Columbia University.